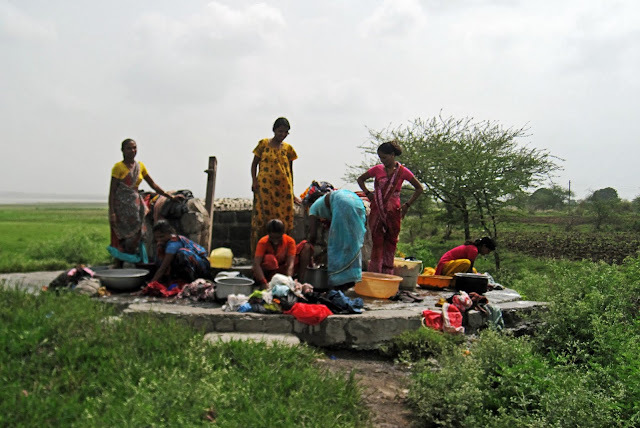 These images are of village women filling and carrying water and also washing clothes near wells. They were shot in different places, but all scenes are from the western state of Maharashtra, India. The first visuals are long shots of village women and girls filling water from a well in semi-rural India. 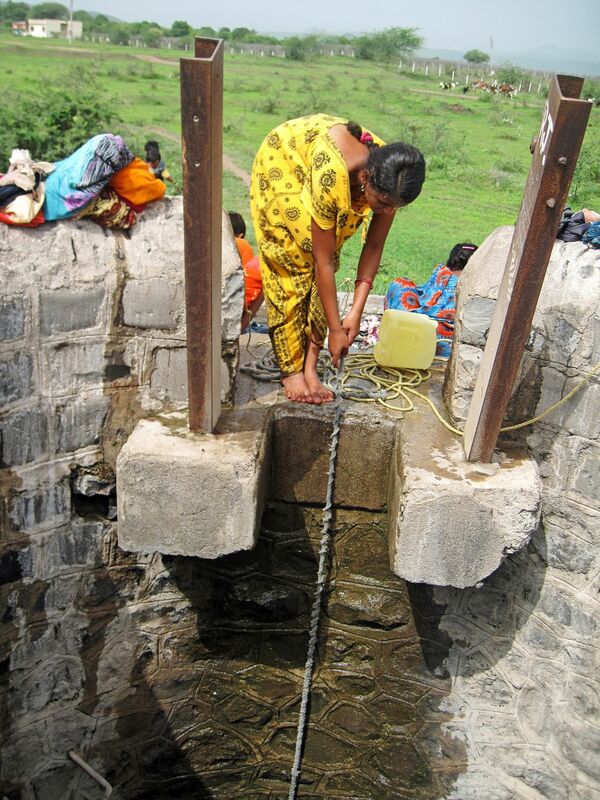 Also of women washing clothes near the well. Usually it is women who do the job of filling water, not men. 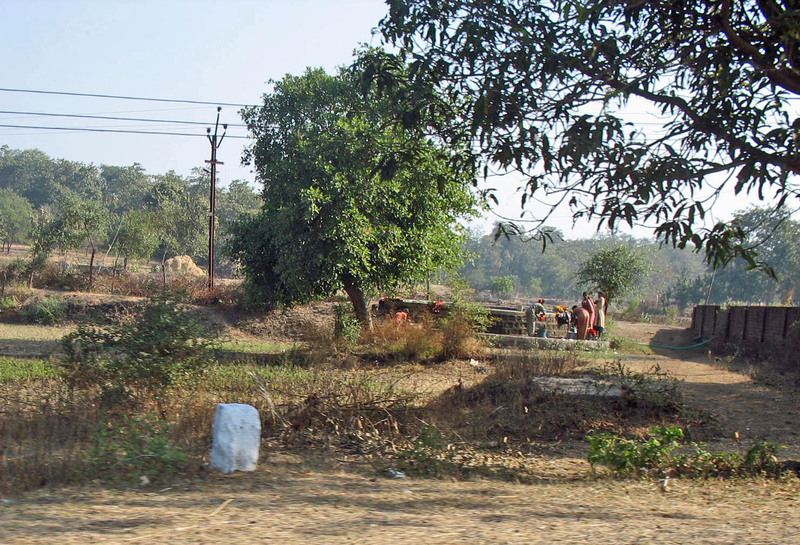 Water is not available on tap in most villages, or if it is, then it is not sufficient for daily chores. 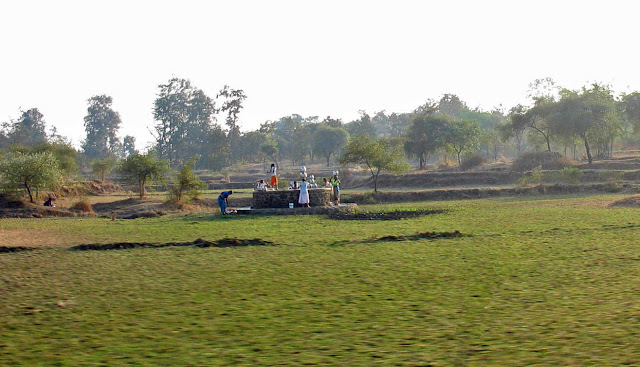 Often, women walk long distances from the well to their homes. Here you can see women and girls with pots of water on their heads. Here are women drawing water from a well and washing clothes by hand at the foot of the well near a small village near Nasik, Maharashtra. A close-up of the women, one in the traditional sari while the girl is in a gown. Married women invariably dress in sarees. The mangalsutra around her neck proclaims to the world that she is married. She has pulled up water in a broken plastic bucket and is using it for washing clothes. This particular well is not the place from where they get their drinking water they told me. They get their drinking water from another well, at the other end of the village. A close-up of the girl drawing water from the well with the help of a rope and a plastic container. No pulley seems to be visible. 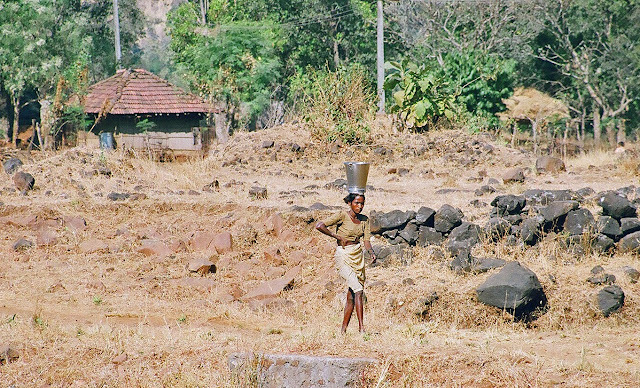 This visual is a close-up of a tribal woman carrying a steel bucket to fetch water for her home. Steel buckets and metal pots are an embodiment of people who are better off. The poorest of the poor still use clay pots.The woman is from a village near Khopoli. Women in rural India tend to do hard physical labour and as a result are thin and wiry. This is a photograph of a Tingatinga painting I picked up on the streets of Dar-es-Salaam, Tanzania. As Dar is the place where this style of painting orginated, I am sure it is genuine Tingatinga even it is in a way street art and a simple one. 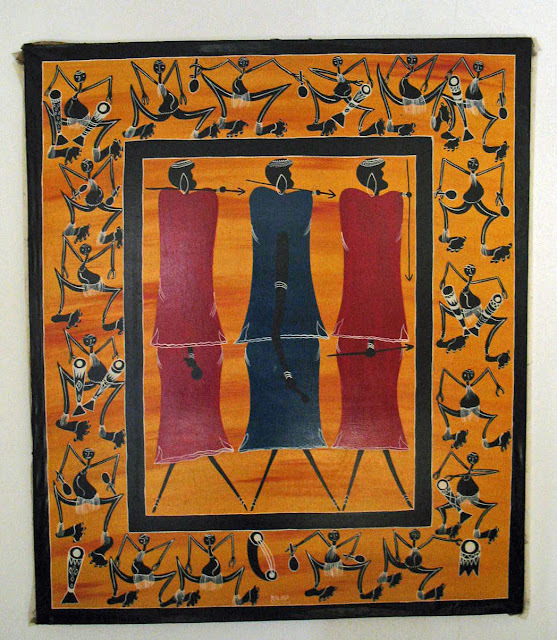 The Tingatinga painting style is named after Edward S. Tingatinga, a Tanzanian. He established this form of art in the sixties. Technically, Tingatinga art is painting on masonite using bicycle paint in bright colours, and traditionally these are supposed to be very large paintings. Nowadays this doesn't hold true, with a lot of miniatures available. The one published here is a fairly large painting around four-five feet in height. The motifs, patterns and designs are based on East African Swahili culture. This art has influenced modern African art. These are pictures of accidents of trucks, tempos, and motor cars involved in accidents in India. 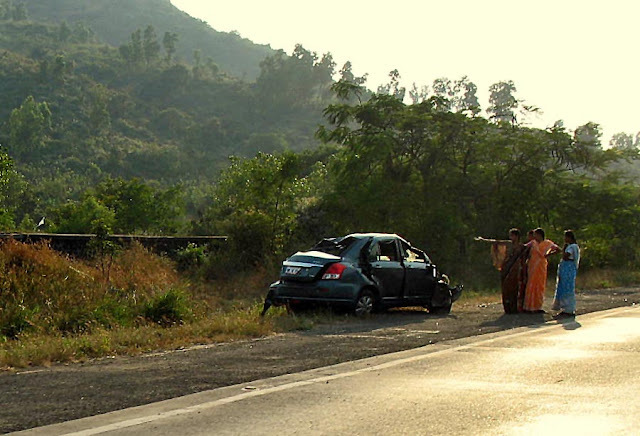 India has the maximum road accidents or traffic collisions in the world. 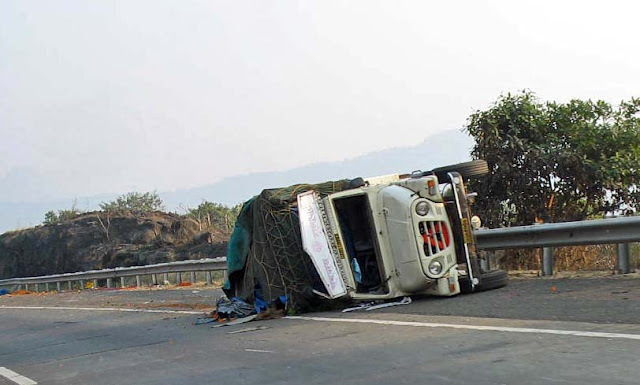 A National Crime Records Bureau (NCRB) report statistics revealed that annually more than 140,000 deaths from road accidents occur in India - these are 2012 figures. Deaths by road accidents are rising steadily. 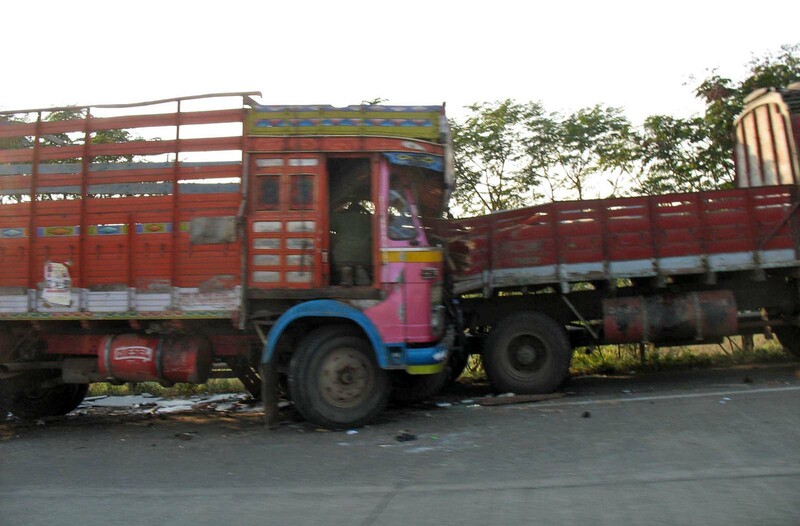 This first photograph is of a truck smashing into another from the back. 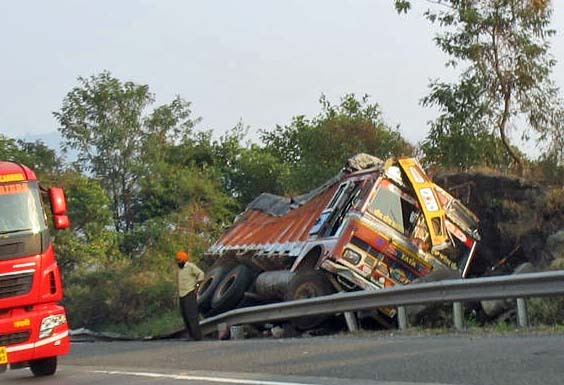 Heavy vehicles are most often involved in major accidents. 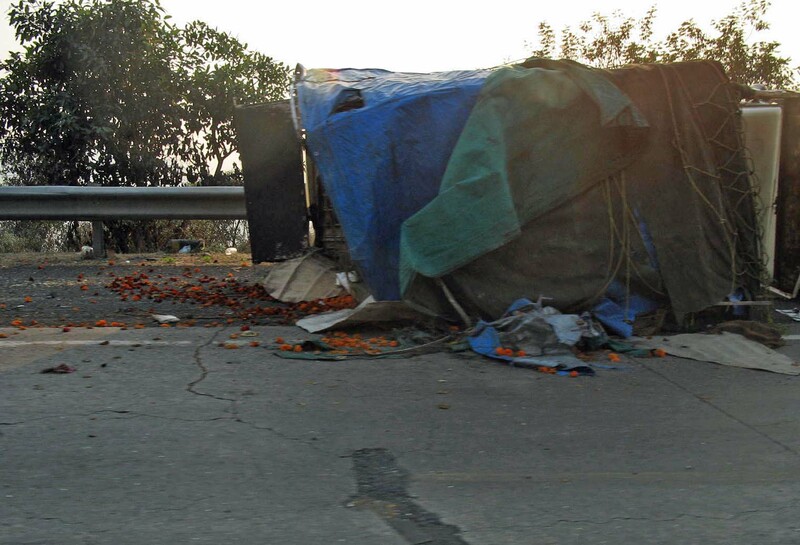 This tempo carrying flowers was in an accident with two vehicles, a truck and a car. The truck had been moved but the car can be seen in the photo after the next. This is a close-up of the same tempo. This is the car which was in the accident with the tempo. Three women passing by are staring and pointing at this badly smashed car. This looks like a fatal accident. Bystanders, gaping at a smashed and wrecked car. 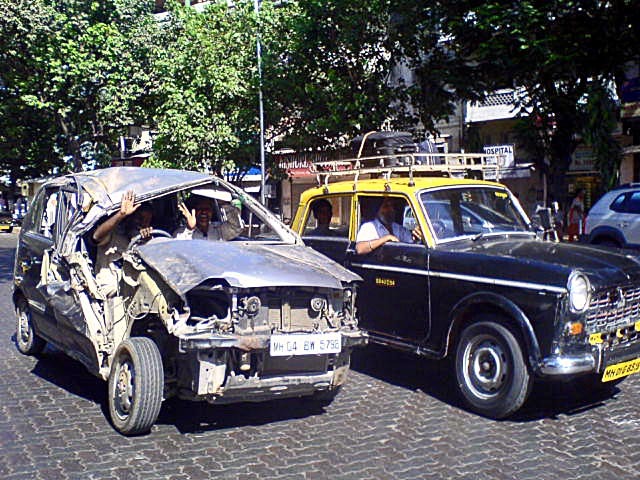 A wrecked car photographed in Mumbai city. It can actually be driven and I guess that is why the people in it are so kicked. 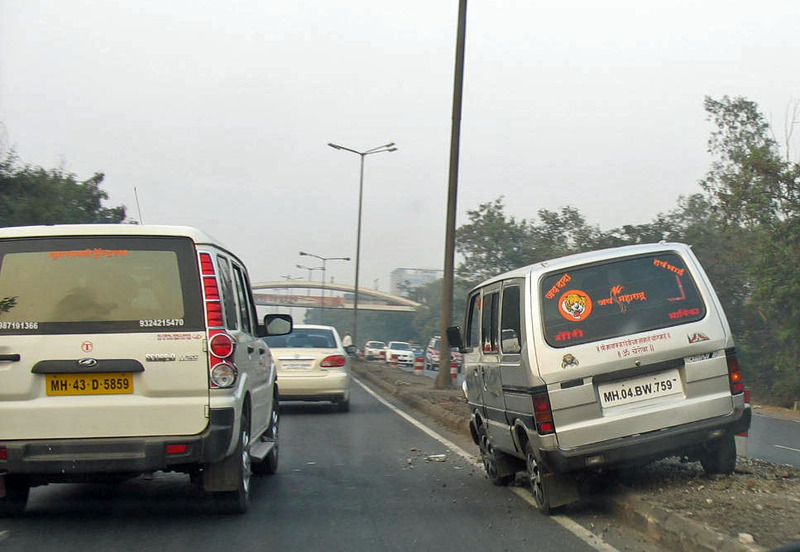 This Maruti van has climbed on the divider. Amazing how people drive! This truck lost control and went into a ditch on the side of the highway. This picture, shot from inside the windscreen, didn't come out too badly. The foreground of the windshield and wipers made an interesting contrast with the overturned truck. 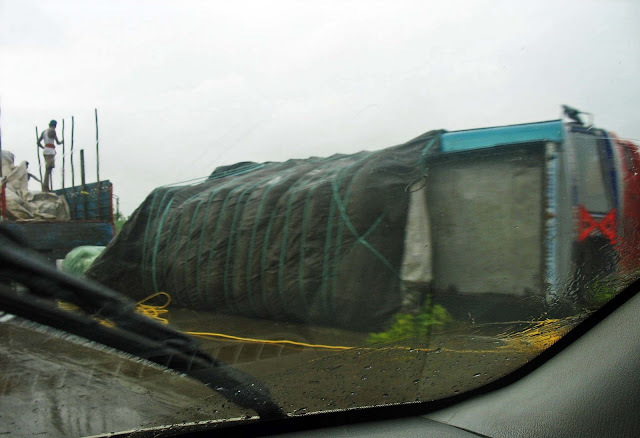 It was a rainy day and the truck heavily loaded. 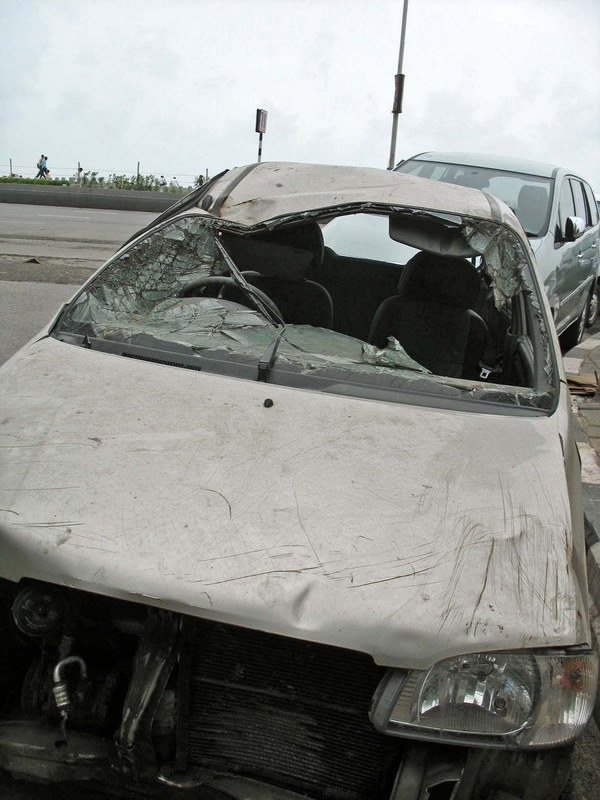 This photo is of a smashed car. It was in an accident in the city. This picture is of a rail track in India.Indian Railways has more than 64,015 kilometres (39,777 mi)of track and about 7000 stations. It has the world's fourth largest railway network. Only the United States, Russia and China have a larger rail network. 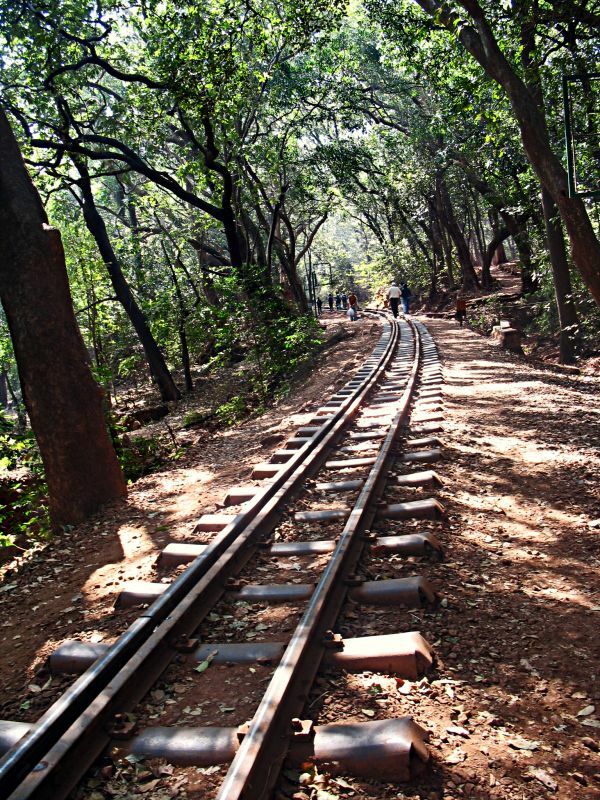 This is a photo of a narrow guage railway track in Matheran, India. 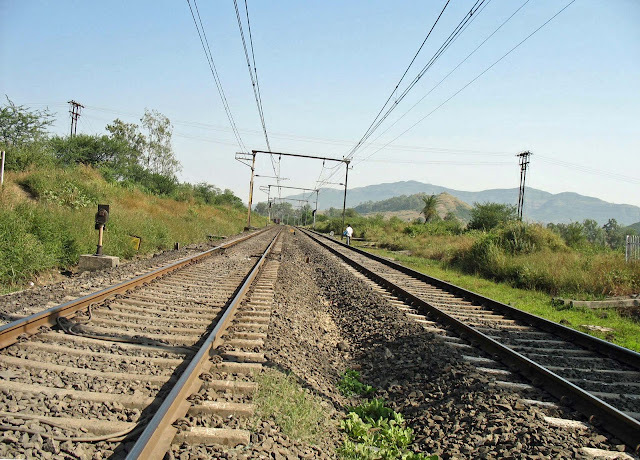 or for Indian railways stations: Mumbai suburban railway station pictures or the heritage building of VT or CST railway station in Mumbai or photos of a platform at Mumbai Central Railway Station. 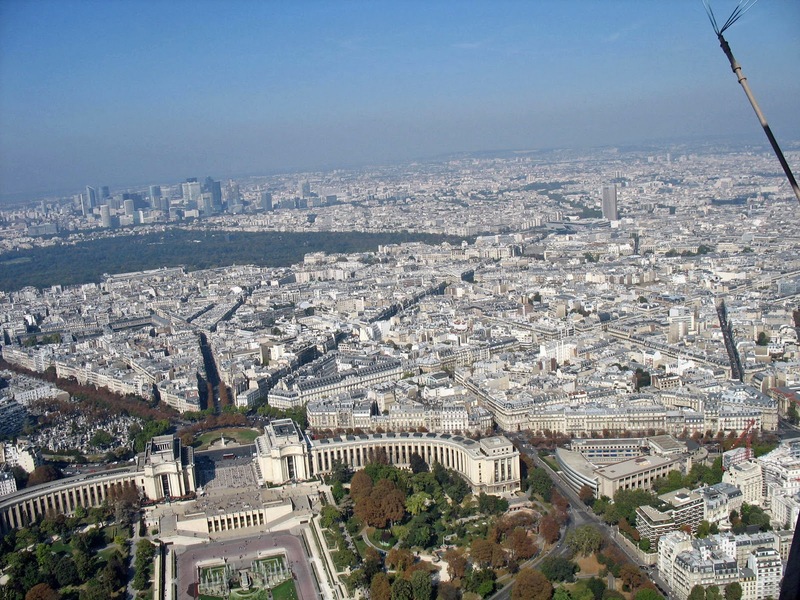 These are two aerial photographs of Paris shot from atop the Eiffel Tower in Paris, France. The first picture is a panoramic view of Paris. 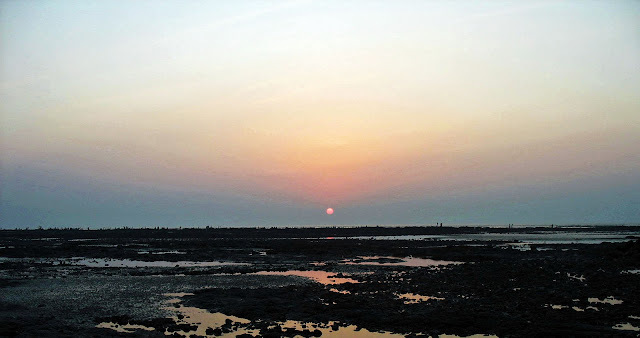 The curve of the horizon is visible. The image below depicts the river Seine and the adjoining area of its banks. The curve of the horizon is visible in this representation as well. The sight below, part of the Trocadéro Garden, was captured from another point on the Eiffel Tower. These three pictures show two men holding hands, a homosexual couple. The pictures can only be used for the web and in the sizes shown in this post as they are not sharp images. The original photo was a little blurred and it has not been put up. 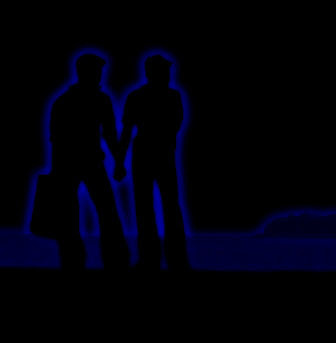 The first image shows the two guys silhouetted against the sea. In this second image I have given a neon effect to the figures. 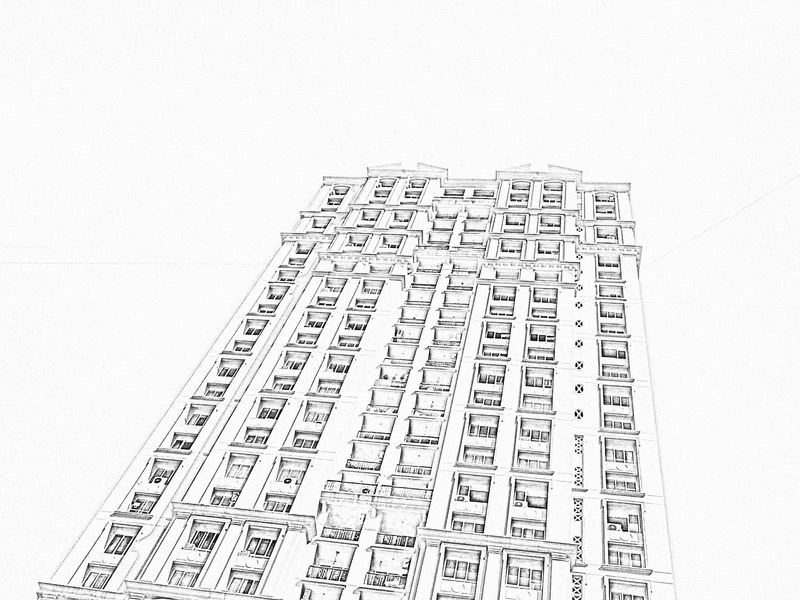 This is a pencil drawing of the same picture. 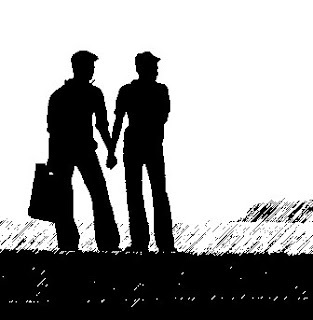 Related Images: Silhouettes of Couples or try the label Silhouettes or the label Sketches for more silhouettes and sketches of people with bags, people walking and that of monuments and places. 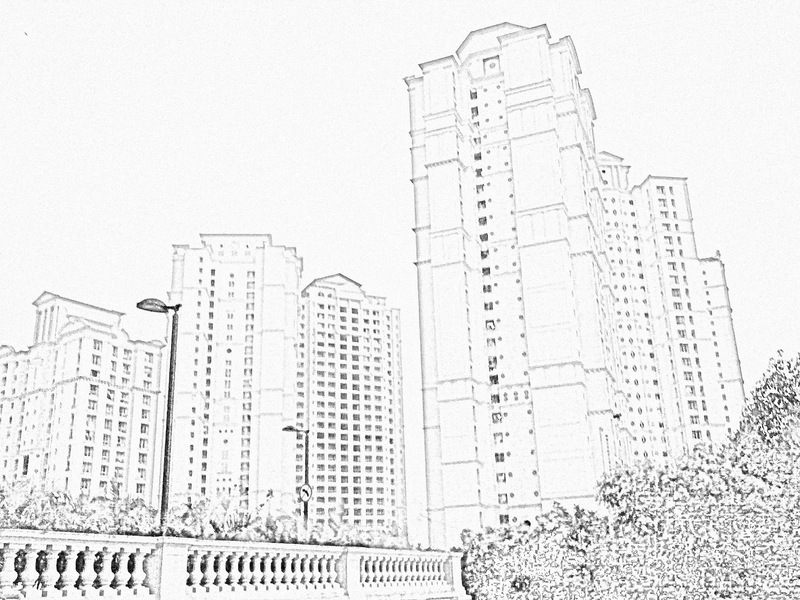 Here are two sketches of skyscrapers in urban India. These pencil drawings are based on actual photographs of these high-rise towers. The drawing below is from the same group of buildings. First one is a shot taken from the ground, looking up the tall building, almost like a worm's eye view. 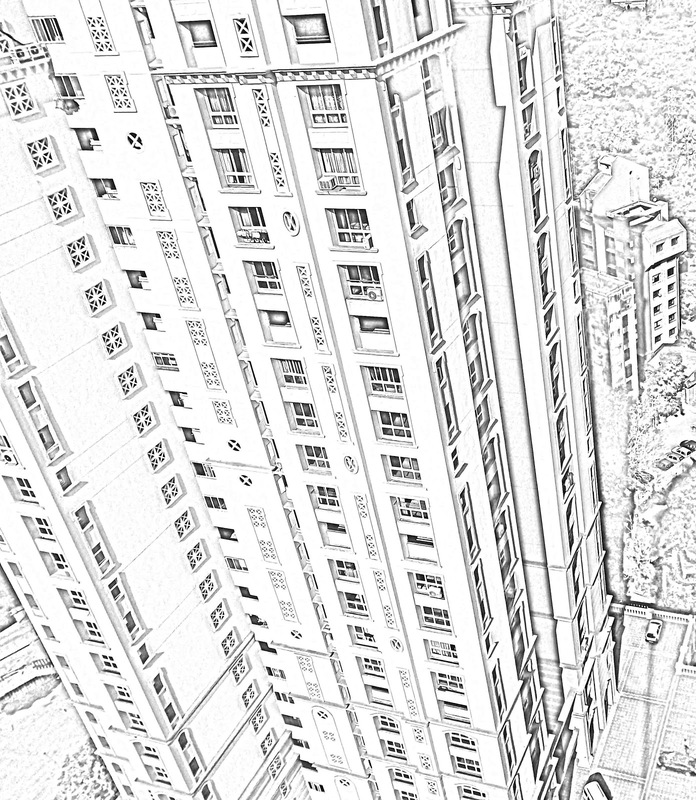 The sketch below is looking down from atop a skyscraper at the adjacent one. 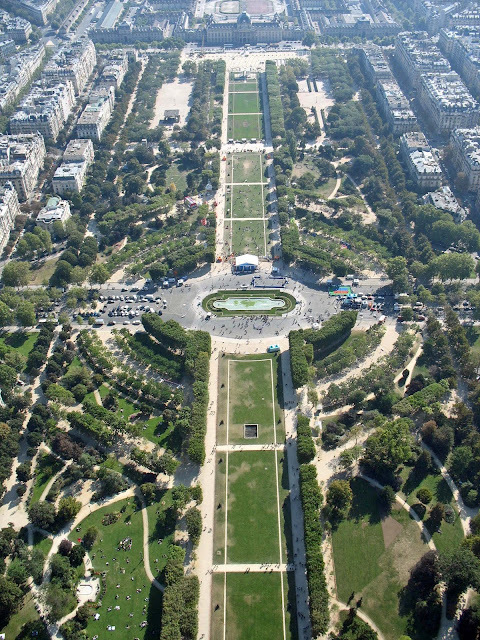 A bird's eye view. 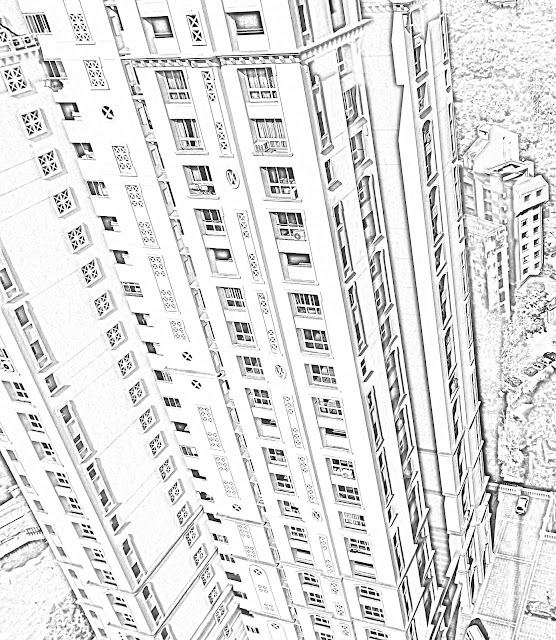 Another skyscraper illustration, a worm's eye view again. 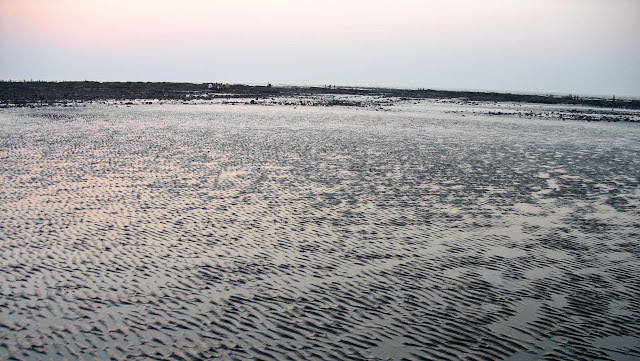 These are photographs of the beaches at Daman, in Western India. Daman's beaches are not the usual sandy beaches. Instead, they are rocky and the sands tend to be black. People tend to like the scenery though and sit on the rocks watching the sea. 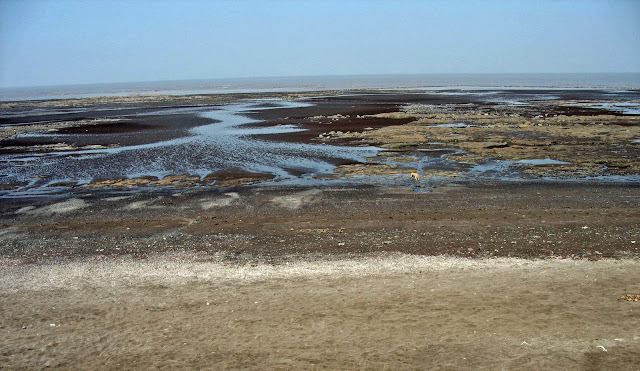 In any case Indians are not very fond of sun-bathing which is what most people do on soft brown sands. The photograph below is a sunset scene at a Daman beach. 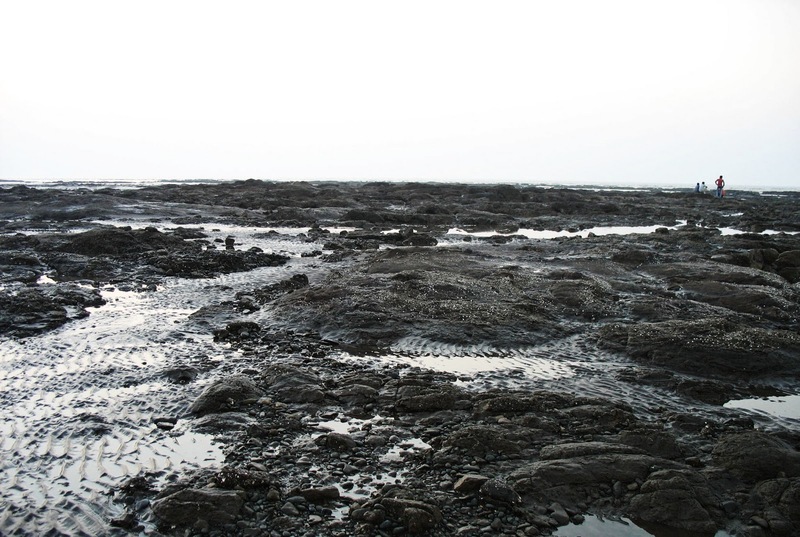 The black sands can be quite picturesque. For other types of headers: Free Headers of Nature scenes - Lake and Trees or Sunrise and Sunsets. Or a sea scene which can be used for a header: Two boatmen in a canoe in the ocean. Or just check out the label Headers under which you will find urban landscapes in addition to nature scenes which can be used as header images. 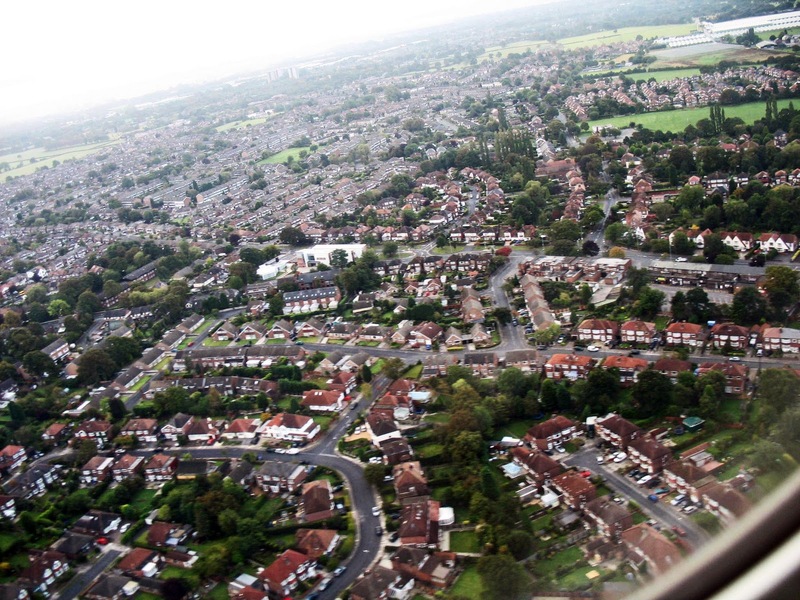 This photograph of Manchester city in the United Kingdom was shot from an airplane window. Contrast was enhanced as the double glass on the window had dulled the image. These are photographs of murals and paintings from Cave No. 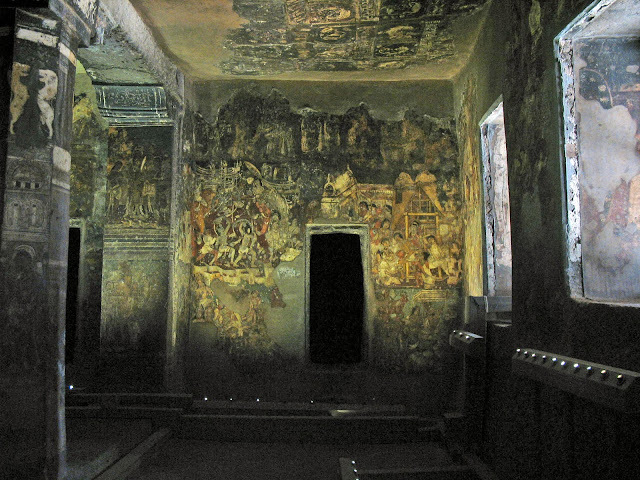 2 of the Rock Caves of Ajanta, near Aurangabad, which are fairly well preserved. The style of Art is called Ajanta. 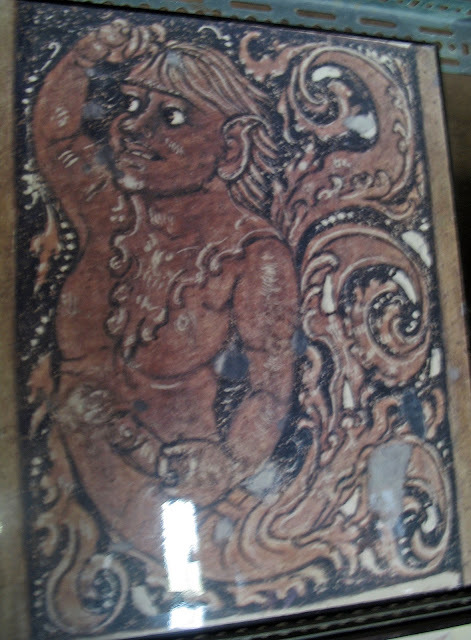 Ajanta Art comprises of different styles from different periods of time, from the 2nd century BC to the 5th century AD. 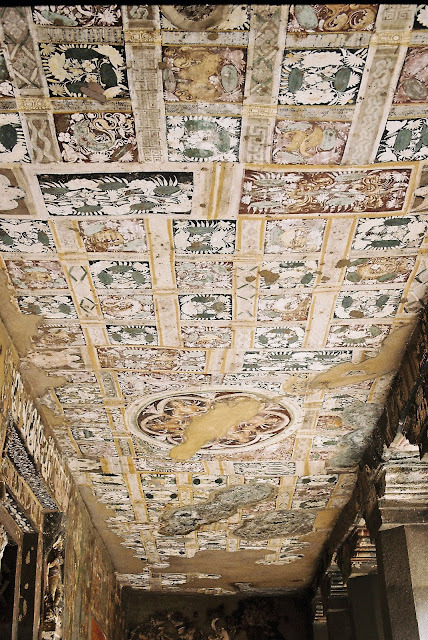 These paintings influenced Art in India for many centuries. Decorative themes using both animals, plants and humans have been used. 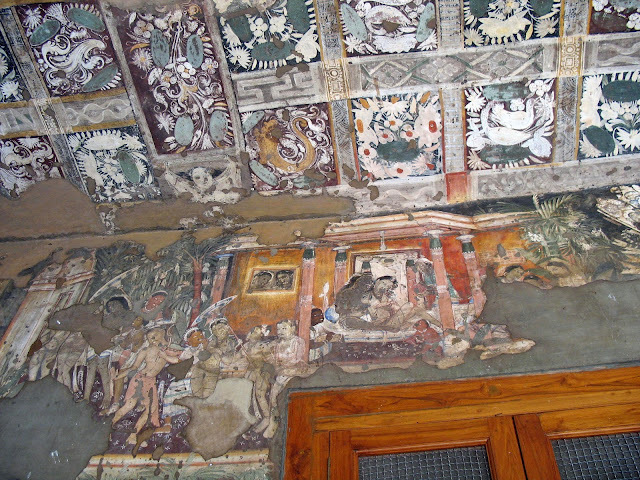 The first image is of art on the ceiling at the entrance to the Cave. Engravings can be seen on the doorway. 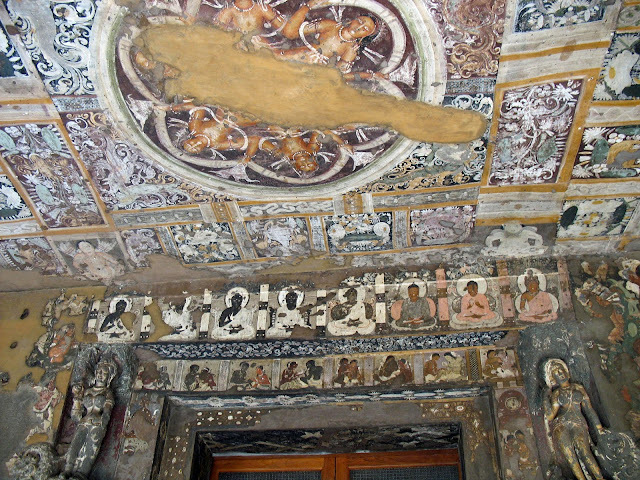 The depiction of Buddha is visible on the top of the doorway. Considering that in ancient times there were not paint brushes as such, and artists used just twigs and animal hair, or painted by hand, the results are quite brilliant! 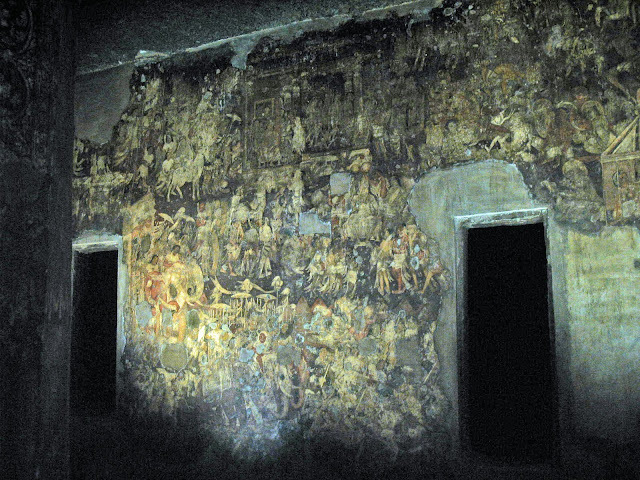 These last two pictures are a glimpse of a wall mural inside the cave. It was quite dark inside and a dim light was shining on the beautiful canvas on the wall. This is a painted pillar from the cave. 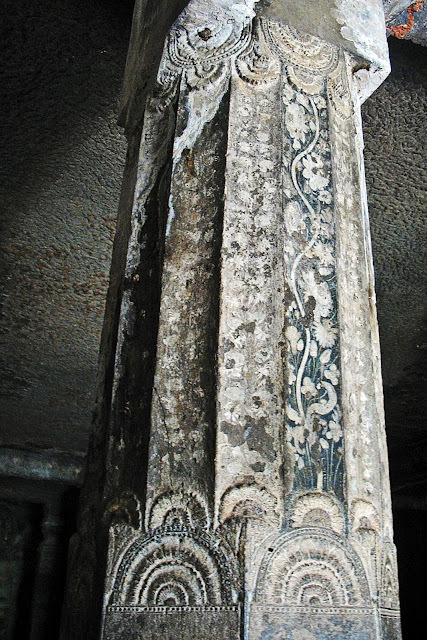 Sculptured decoration at the top and bottom of the pillar are also visible. Remnants of blue paint can be seen on the flower design. This last painting was lying in the office where restoration work was going on. Am not sure where it came from or whether it is original Ajanta or just a copy. For pencil drawings of Buddha: Sketches and drawings of Buddha or simply click on the label Ajanta. For images from Ellora try these posts: Kailashnath Temple at Ellora or Ellora Temples sculpted exteriors or or simply click on the label Ellora. This image is that of sausages, fries/chips and a buttered bun served in an English pub. Eat this kind of food regularly and you are sure to put on weight! The portion is fairly large and the fat or lard is visible as a thick layer. Salt is liberally sprinkled on the fries. The sausages will be high in salt as well, as salt percentages are high in all processed foods. The greens are barely visible in the photograph. If one has to choose a fatty, unhealthy meal, this would surely be a good choice! 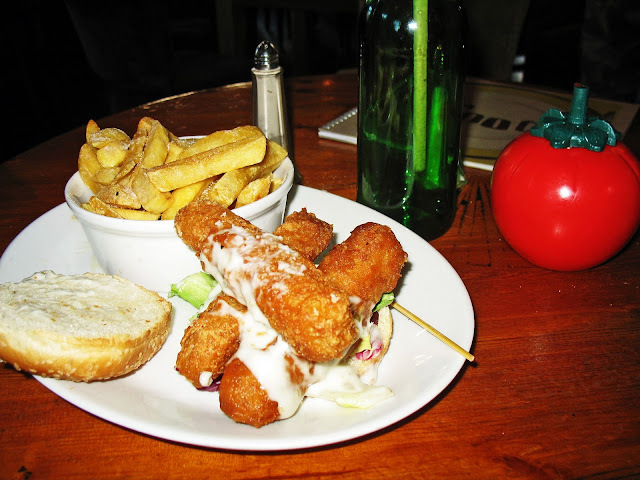 A small sausage is around a hundred calories but these look bigger, and are probably around 150-200 calories. A small portion of chips can range between 300-400 calories and the ones here must be at least 400. The bun? At least another 100 as it is liberally buttered. So this dish should be at least 1000 calories! Not to mention the salt! This type of food would make you more hungry for the next one, because you stomach has already stretched! 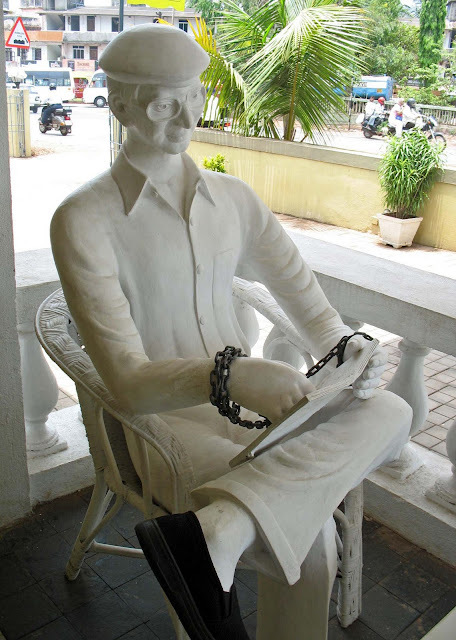 If you thought that only the good guys had their statues made, think again! Charles Shobraj, the notorious half Indian half Vietnamese convicted serial killer has been given the dubious honour of having his likeness sculpted to advertise a restaurant in Goa in which he was once caught by the police. He is known to have committed at least a dozen murders for gain and is known as a cold-blooded killer. He has French citizenship due to the French origin of his step-father. 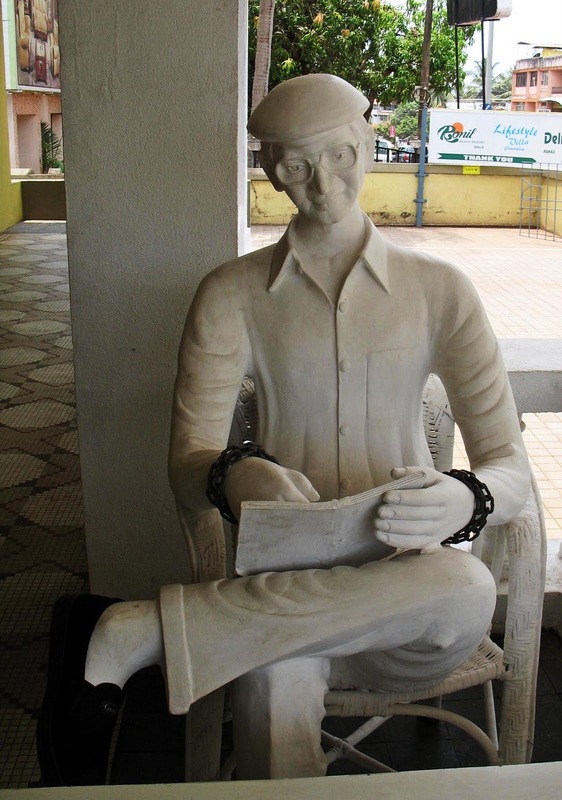 The two photographs are of the same sculpture, although from different angles. Note the chains on his wrists. As is evident from the photo, he was good-looking and sophisticated, and gave the impression of being a gentleman. This is the beginning of series of header scenes of different types. Most of these photographs are of a high resolution and very large files. 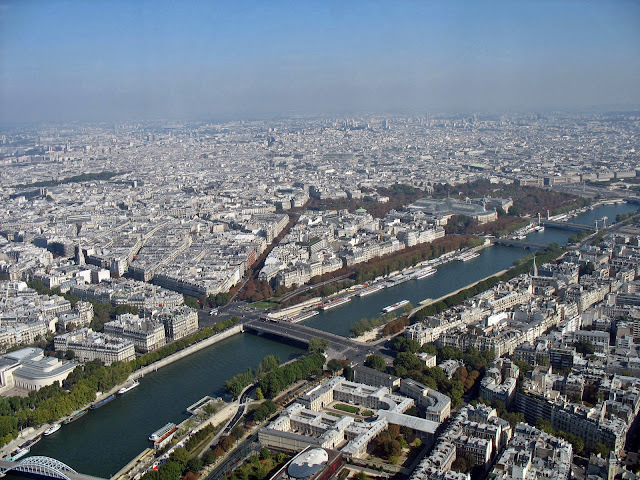 They present a panoramic view as they have been put together by combining several photographs. As sizes of headers differ for different themes, you will not find fixed or matching sizes here. 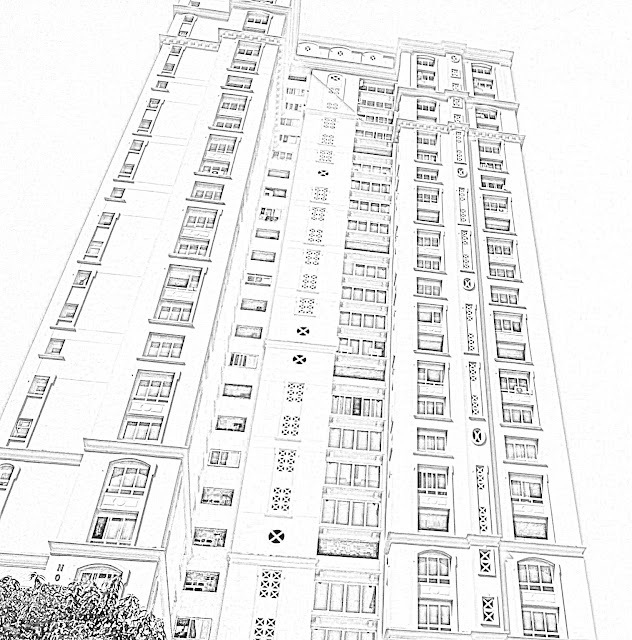 The frame can be adjusted by cropping as per your requirements. Remember, the files are very large and can be cropped to most desired sizes for headers. The scene in the following photos is just one (Kamshet lake and surrounding areas), but at the same time it is different, either because of the angle of the frame, or because a different number of photos make up each image. The first picture is a breathtaking panorama of six different pictures. The result gave me a picture of 1.6 mb. Too large for you to view the actual size on this post but clicking on the image will take you to the actual picture. 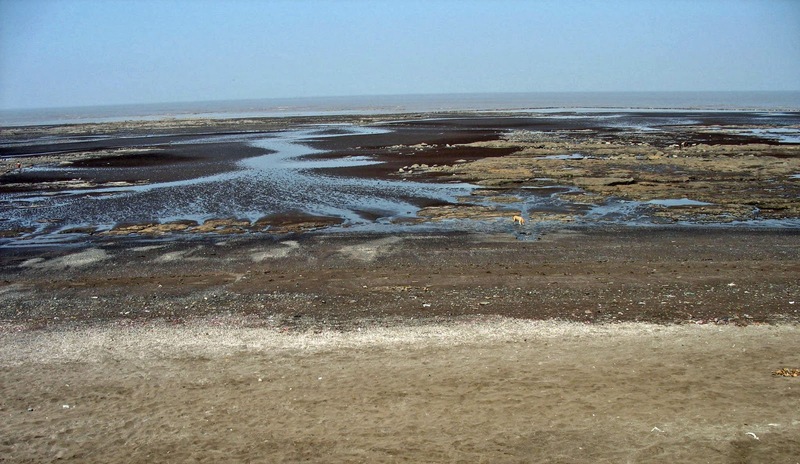 The second photograph also gives a panoramic view of the scene, but it is made up of four pictures, giving you a closer look at the lake. The next photograph is made up of three stitched photos. The scene is similar to the one above but is a closer view. The last photograph is the same scene from a different angle. The trees on the right side of the lake are more clearly visible in this one as well as the little house in the trees. Or click on the label "Nature Headers" if you are looking for free nature headers for your blog. For Urban landscapes which can be used for headers click the label Urban Landscapes. If you click the label Headers, you will find both nature as well as urban scenes.